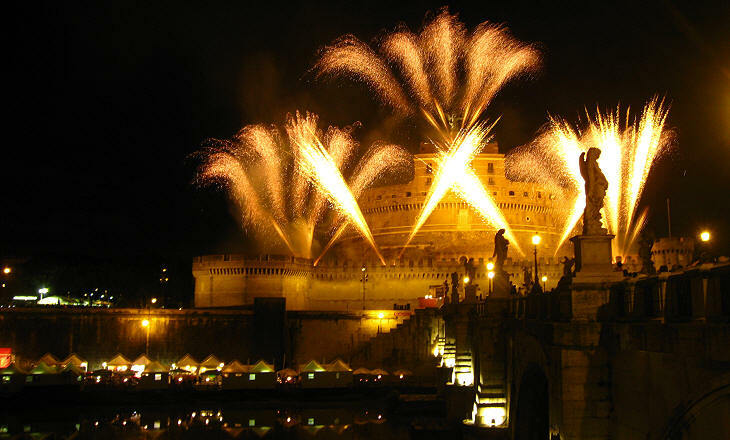 On Easter Monday there was a great display of fireworks from the Castle of St. Angelo. 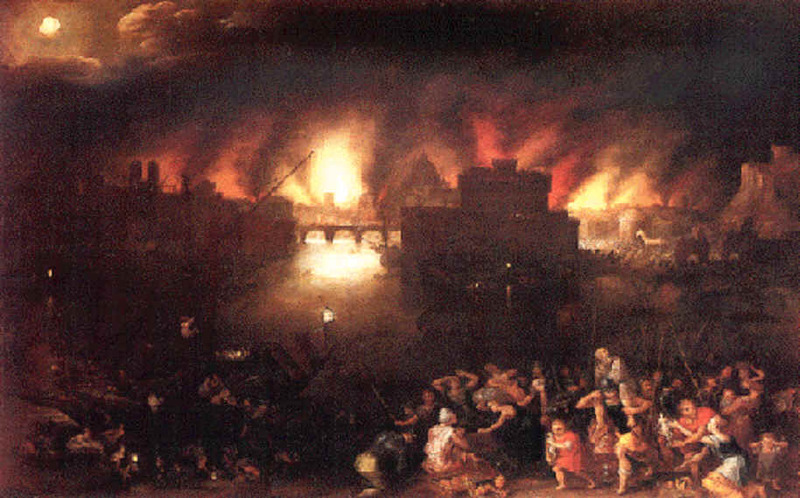 We hired a room in an opposite house, and made our way, to our places, in good time, through a dense mob of people choking up the square in front, and all the avenues leading to it; and so loading the bridge by which the castle is approached, that it seemed ready to sink into the rapid Tiber below. 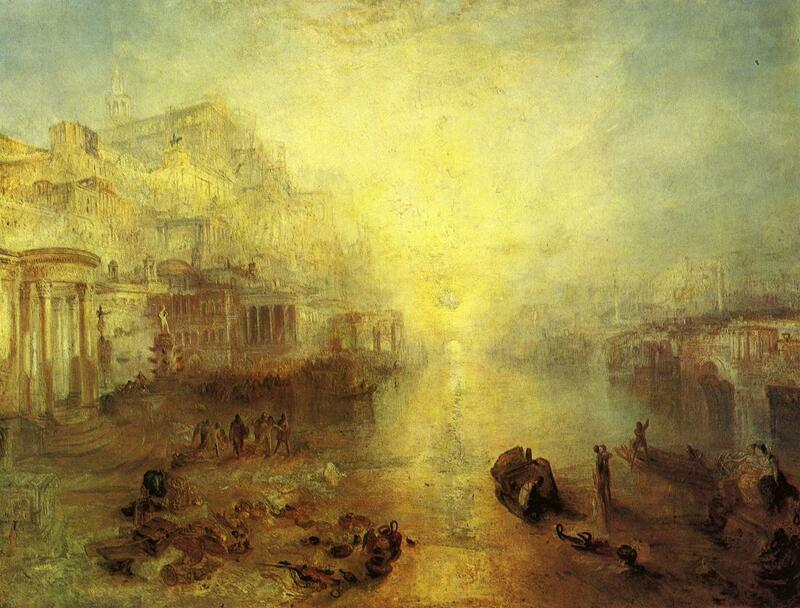 There are statues on this bridge (execrable works), and, among them, great vessels full of burning tow were placed: glaring strangely on the faces of the crowd, and not less strangely on the stone counterfeits above them. The show began with a tremendous discharge of cannon; and then, for twenty minutes or half an hour, the whole castle was one incessant sheet of fire, and labyrinth of blazing wheels of every colour, size, and speed: while rockets streamed into the sky, not by ones or twos, or scores, but hundreds at a time. The concluding burst - the Girandola - was like the blowing up into the air of the whole massive castle, without smoke or dust. In half an hour afterwards, the immense concourse had dispersed; the moon was looking calmly down upon her wrinkled image in the river; and half - a - dozen men and boys with bits of lighted candle in their hands: moving here and there, in search of anything worth having, that might have been dropped in the press: had the whole scene to themselves. (Charles Dickens - Pictures from Italy). 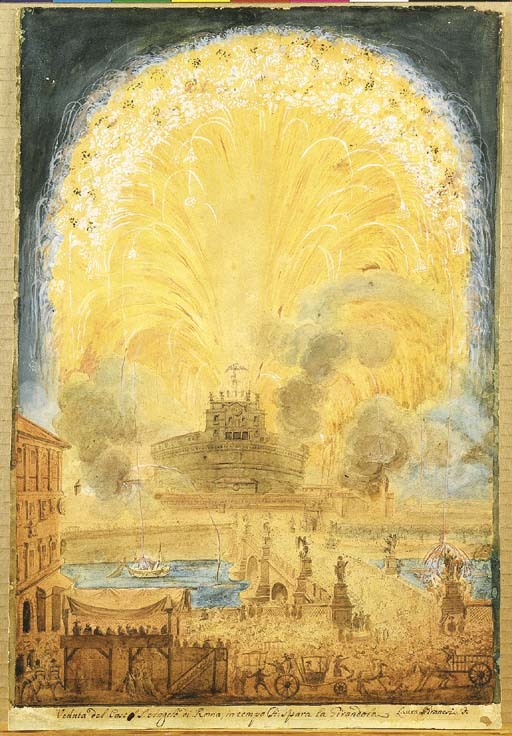 In 1845 Charles Dickens attended one of the last firework diplays at Castel Sant'Angelo; in 1851 Pope Pius IX relocated la Girandola, as these fireworks were commonly known, to Terrazza del Pincio; this probably because Piazza del Popolo, the large square below the terrace, allowed a large audience to watch the fireworks without being tightly packed together, but as J. W. Goethe noted in his Italian Journey in June 1787: The fireworks at Castel Sant'Angelo were beautiful because of their setting. 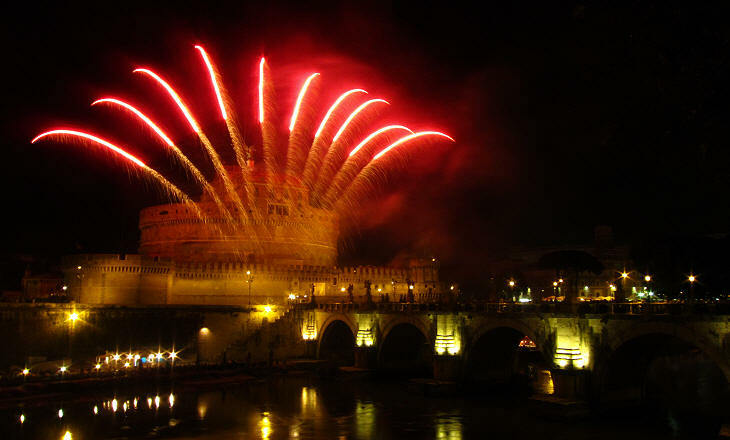 The fireworks were occasionally staged again at Castel Sant'Angelo until 1887; after this year the construction of walls along the river led to Piazza di Ponte, the square in front of Ponte Sant'Angelo where the Romans had gathered to watch the display, being replaced by the lungotevere, a new street lined with trees which impaired the view of the castle. 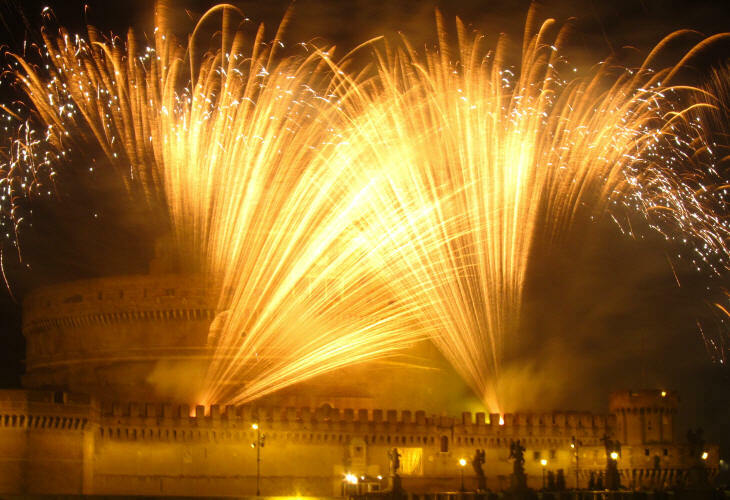 In 2008 the City of Rome decided to re-enact the historical fireworks to celebrate the 500th anniversary of Michelangelo starting to paint the ceiling of Cappella Sistina. The initiative was very well received and it has been repeated since then on June 29, the Feast of Sts. Peter and Paul, the patron saints of Rome. The photographs which illustrate this page were taken in 2009 and 2011 from two slightly different locations. 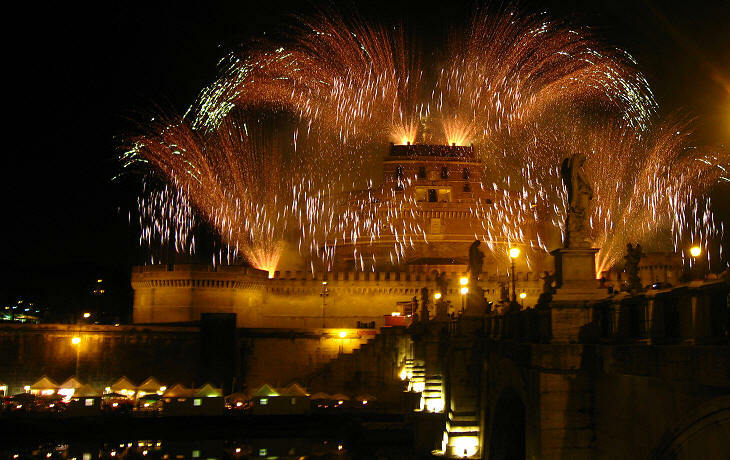 The centrepiece of the fireworks at Castel Sant'Angelo was a vast explosion of thousands of rockets above the castle tower rising up into the sky, their spreading "wheat sheaf" shape giving the spectacle its title by analogy to "girandola" fountain sprays, not to be confused with wheels, the usual meaning of the word in Italian. Biringuccio likened the explosion of rockets to the "fire imagined in Hell"; Ambrogio Brambilla, a Roman engraver of the second half of the XVIth century (you may wish to see his etching showing the Girandola at the British Museum - external link) identified the fireworks with a meteoric tempest, describing how rockets "burst in the air in the shapes of stars. It seems as if the sky had opened ... it seems as if all the air in the world is filled with fireworks and all the stars in the heavens are falling to earth - a thing truly stupendous and marvellous to behold" (from Fireworks: Pyrotechnic Arts and Sciences in European History by Simon Verret). Rome Ancient and Modern is a very detailed guide to Rome which was published in 1842 by Rev. 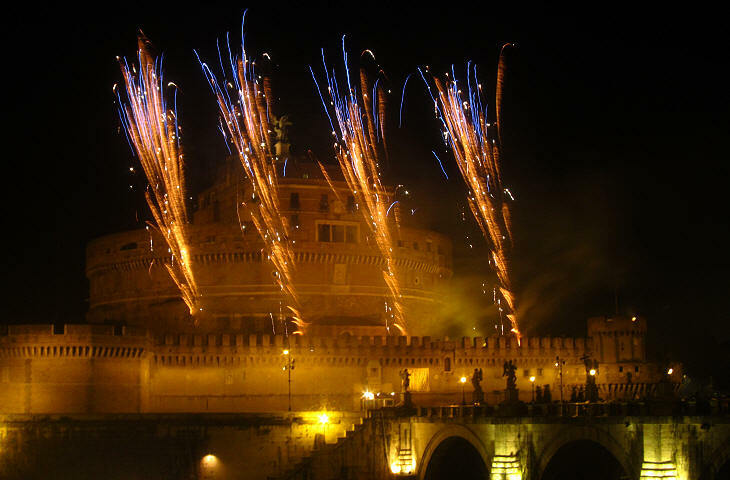 Jeremiah Donovan, an enthusiast supporter of the Papal Government; he so described the fireworks: "The Girandola takes place on occasion of Easter Sunday and the Feast of Sts. Peter and Paul and occasionally on the Coronation of a new Pope. Its original design is ascribed to Michelangelo. 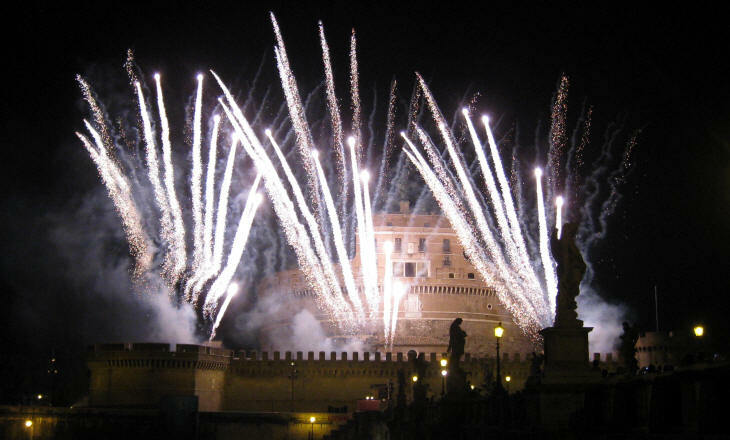 It commences two hours after night at the castle of S. Angelo, the isolated position and elevated circular form of which contribute not a little to the grandeur of the spectacle. The first and last schiappate, formed each of 4,500 rockets, are truly grand. The rockets, in the first instance, are let off simultaneously, and blaze upwards into the glowing heavens to descend in liquid streams upon the earth. To this succeeds an incessant and complicated display of varied devices, one changing into another and surpassing in beauty. Numerous wheels whirl round with incredible velocity, casting from them, in every direction, fiery snakes and hissing dragons: fountains and jets throw up their blazing cascades to descend in floods of liquid fire: the architectural designs, traced in fire on the castle, disappear in the varying conflagrations; and, after a short pause, bursts forth the final explosion, which fills the whole vault of heaven with its vivid fires amid the roar of cannon, rivalling in sublimity of effect the awful burst of a volcanic eruption! The reflection in the depth of the calm waters of Old Father Tiber is as beautiful as the spectacle itself is sublime." 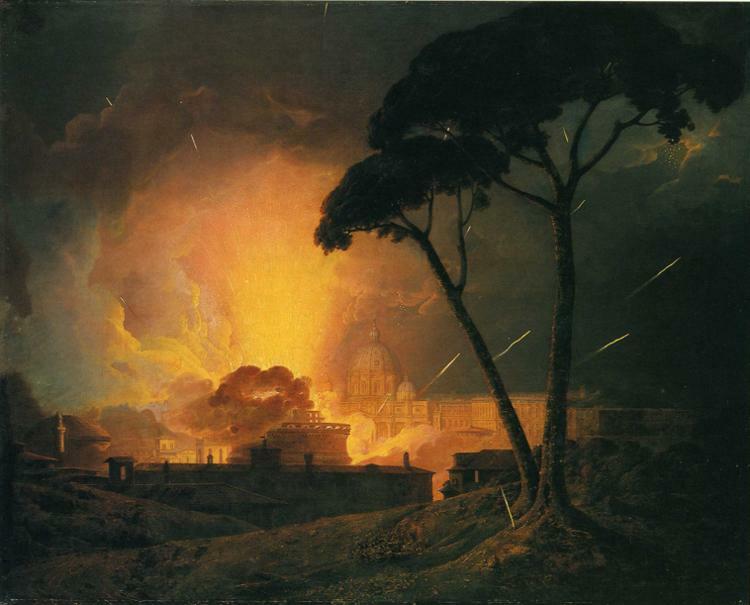 The Girandola was combined with the illumination of the dome of S. Pietro; the two events took place on the same evening; Goethe was fascinated by the illumination more than by the fireworks; Rev. Donovan gave this description of how it was accomplished: "The illumination commences at the Ave Maria, when the gathering shades of night render it every moment more brilliant. All the architectural points of the church, its columns, capitals, cornices and pediments, the magnificent swell of the lofty dome, with its converging ribs, surmounted by the lantern and crowned by the cross, are all designed in golden lines of fire, as is also the vast sweep of the colonnades, being all lighted with 4,400 transparent lamps. In the first instance the illumination appears to be complete; but while we gaze on it with delight, the great bell of St. Peter's chimes, when on the luminous cross, at the top, waves a brilliant light, as if wielded by some celestial hand; and instantly globes and stars of vivid fire seem to roll spontaneously and self-kindled along the whole of the cupola, façade and portico, which burst in a moment into one dazzling blaze of glory. This instantaneous illumination, which seems the work of enchantment, is accomplished by the unseen agency of 360 men, who, with lighted torches carefully concealed, are suspended by ropes even from the swelling surface of the vast dome and the towering summit of the cross, and who to the 4,000 lamps add 1,000 large lamps filled with pitch, rosin and other inflammable substances. Seen from Trinità dei Monti the dome seems some supernatural creation, suspended in air from the vault of heaven, or held beneath its azure concave expanse by some mighty and mysterious hand; while its masses of flame, rendered tremulous by the curling night-breeze, appear like so many distant comets arrested in their devious courses by the fiat of Omnipotence." 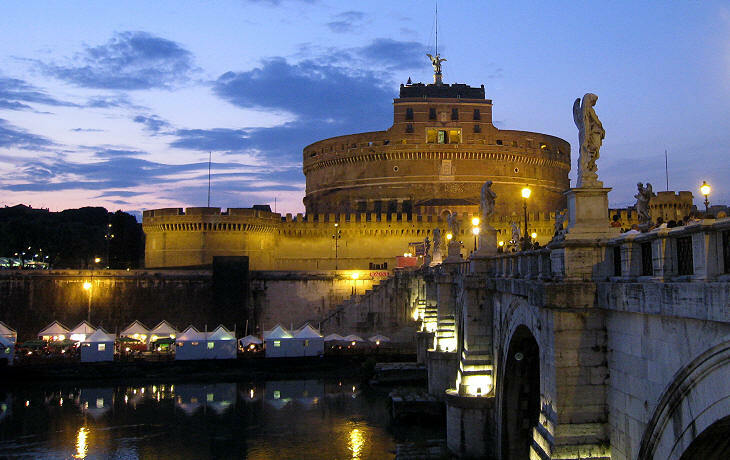 In 1594 Cardinal Pietro Aldobrandini, nephew of Pope Clement VIII, founded Compagnia dei Bombardieri di Castel Sant'Angelo, the gunners' guild, which staged the Girandola after that. The gunners took care of the safe execution of the fireworks the design of which was generally assigned to an architect who specialized in amusement and theatrical events. 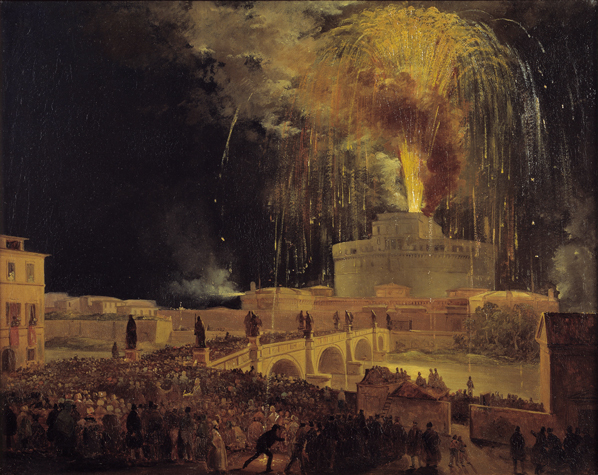 Firework displays were not limited to the Girandola, but they marked the pinnacle of other ceremonies such as la Chinea or special events, such as the arrival of a great personage or marriages or births in the great Catholic royal families. Chinea is the name given to a ceremony during which the King of Naples (or the chief of the Colonna family on his behalf) presented a white horse to the pope, in recognition of his supremacy. 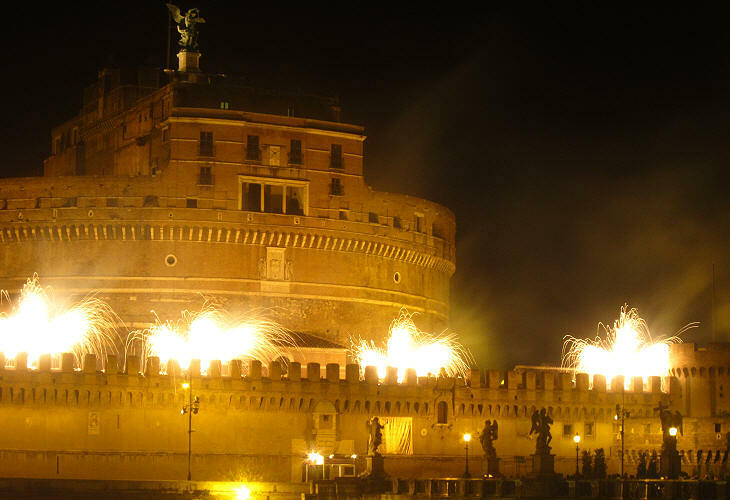 The ceremony included fireworks launched from an ephemeral structure (Macchina della Chinea) erected in Piazza SS. Apostoli in front of Palazzo Colonna or in Piazza Farnese. 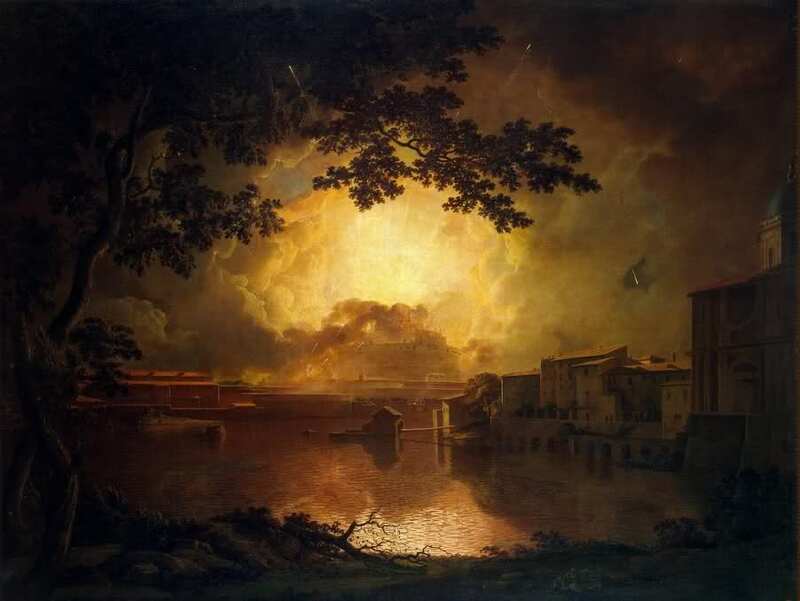 The Girandola inspired many painters and engravers; in some cases in an indirect way as in Aeneas fleeing Troy (external link) by Jan Brueghel the Elder and in Ovid Banished from Rome by William Turner, but generally the title of the work made explicit reference to the fireworks as in two paintings (1) (2) by Joseph Wright of Derby. The fireworks were depicted in many engravings including those of Laura and Francesco Piranesi (external links), offspring of the famous engraver Giovanni Battista Piranesi. One of the last views of the Girandola is a work by Ippolito Caffi, a painter who opened a studio in Rome in 1833.